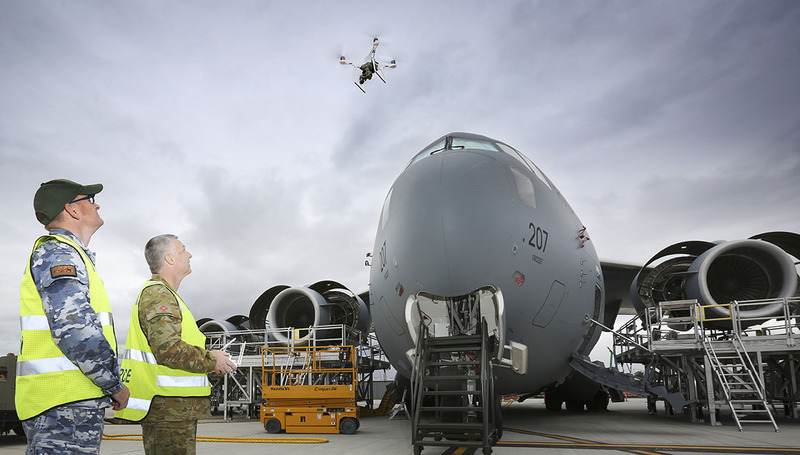 The RAAF’s 36 Squadron is using the popular DJI Phantom 4 drone to conduct visual inspections of its C-17 Globemaster transport aircraft. Using the consumer-level drone, which retails for around $1,100, means 36SQN maintenance personnel can inspect hard-to-access areas of the aircraft, including its 16.8-metre high vertical stabiliser, for paint and surface damage, without using elevated platforms or having to climb through the aircraft. 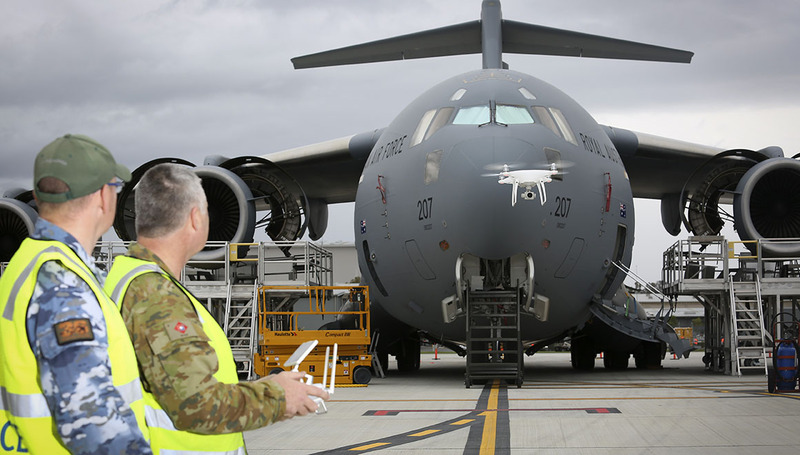 The RAAF’s 36SQN operates eight Boeing C-17s from RAAF Base Amberley. Every 180 days each C-17 undergoes a ‘home station check’, which includes an inspection of aircraft paint and surface damage. Using the drone for those inspections takes as little as 30-minutes. “This helps the aircraft surface finishers to identify and track paint degradation on the upper surface of the C-17A, triage paint defects and plan remediation work,” 36SQN senior engineering officer Squadron Leader Evan Smith said. Using the Phantom drone to capture high-resolution images and video also allows a history of the aircraft’s paint and surface damage to be recorded. “We’re bedding down the procedures for these inspections, and will investigate expanding our use of the drone to include other upper surface inspections,” SQNLDR Smith said. Also under investigation is the use of multi-spectral cameras including thermal imagery. “This would potentially allow us to detect less obvious paint defects, where non-uniform emissivity results from changes in surface roughness,” SQNLDR Smith said. Commander Air Mobility Group Air Commodore William Kourelakos said introducing the Phantom drone was an example of “bottom-up” innovation from within 36SQN under the Air Force Safety Always Program. “Introducing this drone and these procedures goes further to reducing workplace health and safety risks to so far as reasonably practicable,” AIRCDRE Kourelakos said. The Phantom was introduced into 36SQN service with the aid of Army’s 20th Surveillance and Target Acquisition Regiment. “The Army has extensive experience using this particular model, and managing the information downloaded from it,” SQNLDR Smith said. AIRCDRE Kourelakos said Air Mobility Group is investigating using drones across other aircraft in the Air Mobility Group fleet. What I find curious as well is that the RAAF have personnel with RePL but prefer to use the Army drone operators. My question is if ASIS, ASIO, ADF all know that Huawii, DJI etc are all Chinese owned, linked to the MSS then why do they continue to use their drones and CCTV cameras. If the US has banned a lot of these companies then we should be doing the same thing. It isn’t rocket science. With Australia so worried about Chinese manufacturers like Huawei having spyware intended to infiltrate government bodies via usage of their products, how come the military is so blasé about utilising another Chinese company that was proven to have utilised information from the applet needed to operate the Drone having access to everything from GPS coordinates, visual feeds and numerous other data. It’s great to see good ideas from the work force being adapted to make theirs life easier and safer.